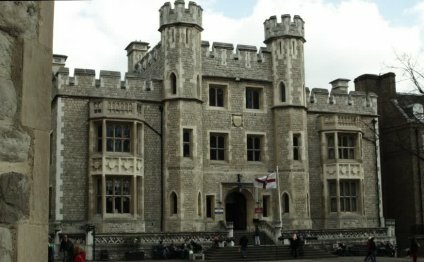 The Tower of London is admired for its architecture and its history but it is most remembered for the bloody executions, imprisonment and torture of the prisoners who were incarcerated in the great London castle. The mysterious deaths, like those of the two little Princes in the Tower and the tragic story of the execution of the pathetically young Lady Jane Grey. The execution of Queens of England - Catherine Howard and Anne Boleyn. The torture of various prisoners including the racking of Anne Askew, the interrogation of State prisoners such as Guy Fawkes. The executions of men of peace like John Fisher Bishop of Rochester and Sir Thomas More. This history is detailed in the Executions & Beheading at the Tower of London. The infamous dungeon called the 'Little Ease'. And the instruments of torture. The Tower of London was built to overawe and frighten the indigenous population - it succeeded. The names of some of the famous Prisoners and their stories are detailed in this section which even include how they were taken to the Tower of London via Traitor's Gate. The Tower of London is the most famous of all the Medieval English castles. Its bloody history encompasses some of the most important events in English history. The fortress is strongly associated with William the Conqueror who invaded England in 1066. William the Conqueror initially built a wooden Motte and Bailey castle and the famous, fortified, stone White Tower, which replaced the original Motte and Bailey castle, was completed in 1097. The design and structure of the great London fortress started with William the Conqueror as a timber Motte and Bailey castle. Construction of the stone tower keep started in 1078 and was completed in 1097. The Tower of London assumed its form as a 'Concentric Castle' with successive lines of fortification, only after hundreds of years and several different reigns. There are 21 different towers which form a major part of the London castle complex. These famous buildings are fully detailed in the section The Towers in the London fortress which include the White Tower and the Bloody Tower.